Much like the trends on a ramp evolve every season, in the same way legal strategies of the industry’s leading fashion brands, fashion-houses and designers are in flux. Fashion is something to which each one of us relates. It is a part of everyone’s daily life; be it in the form of apparels or shoes we wear or a new hairstyle we adorn or the exotic jewellery we flash. Fashion industry is one of the most popular and profit-making industry in any country and yet is also one of the most vulnerable. The vulnerability of fashion emerges from the lack of protection to original ideas and works in terms of Intellectual Property. As a result, many fashion houses are often seen suing for the infringement of their designs. This article depicts the tendencies witnessed in affording IP protection to fashion while focusing upon the recent case of Burberry v. Target. 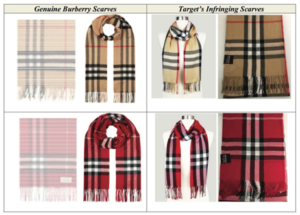 Although the scarves produced by Target are of inferior quality yet they are on the surface indistinguishable from the genuine Burberry scarves. The items sold by Target were not approved by Burberry and such a reproduction of the check print of Target’s items could cause confusion in the minds of the consumers and would lead them to believe that those items are sponsored by Burberry. Burberry claims that Target’s history of collaborating with popular brands and fashion designers to promote and sell Target’s exclusive products further enlarges the scope of consumer confusion. It is stated that the classic cashmere scarf of Burberry sells for $430 which Target is selling for $12.99 (Check it out here Target and here Burberry). Burberry is seeking $2 million for every instance of infringement along with damages to the full extent possible. The first and the most quintessential question which arises here relates to the scope of IP protection in the fashion industry. Fashion brands are not immune to counterfeiting. It is easier for the counterfeiters to copy fashion products and clothing because they are relatively simpler to manufacture as compared to the hi-tech devices. Also, they can be sold with a high mark-up owing to the reputation or goodwill associated with a well-known brand. With the increasing awareness of intellectual property in the fashion world more and more stake-holders are seeking trademarks and other IP protections for their creations. According to the Trademark Industry Report 2017 prepared by Trademark Now, Clothing, Apparel and Luxury Goods industries were under Trademark Spotlight in 2016 with more than 6400 applications being filed around the globe. In order to avoid the menace of counterfeiting, where the counterfeit product incorporates a well-known brand name, trademark enforcement is the best and most effective tool. Fashion brands register their house brand name and key sub-brands. Some of the leading luxury brands have been vigilant to safeguard their shape, color, patterns, cuts, style etc. For example, Christian Louboutin has trademarked red soles of their shoes. He has also sued Zara for infringement. Fashion industry is one of the fastest growing industries in India especially after some Indian designers have earned respect and recognition of other nations. However, the growing fame comes with certain vulnerability erupting from the scope of infringement by other domestic or even international designers. Fashion fraternity of India is slowly getting the hang of intellectual property protection for their creation. In comparison to other countries especially USA, France, Spain and London, India is lagging behind in granting protection to fashion designers. Many designers are still unaware of their IP rights to guard their brands and creations from reproductions, printing, publishing, distribution of prints that are colorable imitations etc. With the growing awareness of importance of IP in the fashion world, there is a serious need to re-evaluate the spectrum of protection that is granted to the fashion industry. Fashion designers should go forward and enhance their knowledge of Intellectual Property Rights and should try to find out most suitable safeguard for their products. The Burberry case is the classic example of how far the fashion industry has come with respect to recognizing their rights and enforcing them at all costs and at all levels. It would be interesting to find out the outcome of this case as it could be a game-changer in the fashion-industry. Author: Aishwarya Pande , Intern at Khurana & Khurana, Advocates and IP Attorneys. In case of any queries please contact/write back to us at swapnils@khuranaandkhurana.com.